Notably, according to analysis by the New England Aquarium, even a small decline of only ten percent in right whale health can impair reproduction or eliminate it entirely. A newly published study shows that a population-wide deterioration in North Atlantic right whale health from 1998 to 2000 was correlated with a drastic drop in calving rates, further indicating that factors influencing health can be responsible for suppressing reproduction. In light of the desperate level of endangerment of the North Atlantic right whale and the serious consequences of entanglement, it is critical that other major stressors are minimized or removed to ensure the recovery and long-term survival of this species. The additional stress of widespread seismic airgun surveys may well represent a tipping point for the survival of this endangered whale, contributing significantly to a decline towards extinction. A year ago, 75 scientists wrote to the Obama administration to urge them to reject plans for seismic surveys and oil and gas development along the Atlantic seaboard. In March of this year, plans to offer drilling leases for the five-year period 2017-2021 were abandoned. A future administration may re-open the area for later five-year planning periods, and the oil and gas industry wants to conduct new surveys in the meantime. 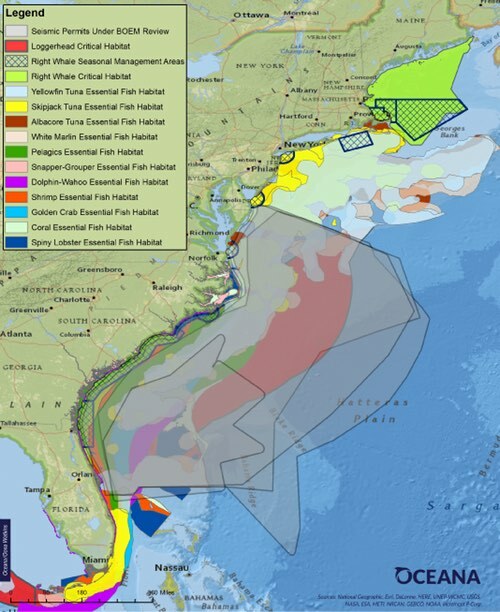 Currently, four companies have applied to the Bureau of Ocean Energy and Management (BOEM) for permits to conduct surveys in the Atlantic (see maps above and below). This new letter from 28 of the same researchers who wrote last year asks the administration to follow up its announcement to keep the Atlantic closed to drilling, by now also withdrawing the 2014 decision to open the area to new surveys, in the light of the new research that is not included in the previous environmental impact statement—or at the very least, to refrain from issuing any permits until after NOAA’s planned 2017 right whale status review, which may confirm whether recent slowdowns in the species’ population growth have continued. The statement is signed by some 28 marine biologists with particular expertise on the right whale, from such institutions as Cornell, Duke, the New England Aquarium, Wildlife Conservation Society (the conservation arm of the Bronx Zoo), UNCW, and Woods Hole Oceanographic Institution. For right whales, it doesn’t get much more authoritative than this. The map at the top of this post highlights designated right whale Essential Habitat (red) and Seasonal Management Areas (blue cross-hatches). Note that the areas largely overlap; this duplication of effort and noise is among the concerns expressed by regional and national ocean advocacy organizations; oil and gas exploration companies routinely duplicate each others’ surveys, with everyone’s data being held as proprietary information. 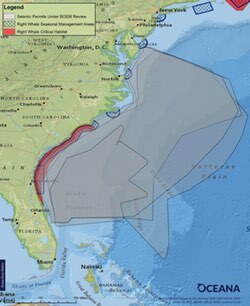 The larger map below shows designated Essential Habitat for a wide range of Atlantic species. One of the proposed survey areas is well offshore, fifty or more miles from the key right whale habitat, while the other three come right to the edge of the designated habits, or even overlap with them. Seismic survey sounds can routinely extend for tens of miles from the survey vessels (and up to 1500 miles in deep offshore waters), so concerns about increased stress—especially in the nursery areas along the southwest coast—apply to all the proposed survey areas, if they take place when whales are present. For more from the researchers involved, see this press release that includes several quotes, and for more on the maps, produced by Oceana, see this article from the Coastal Review and this page on Oceana’s website.